मोबाइल भर्सन कसरी बनाउने ? सायद एक साता भो होला आकार जी ! 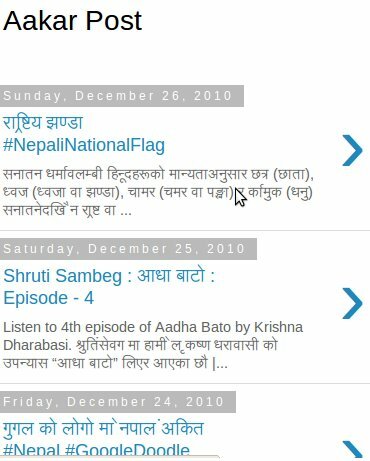 22/23 December 2010 तिर हुनु पर्छ ! गुगल ले त्यसो गरेको -राम्रो कुरा हो ! मैले पनि हतार हतार (खुसि हुदै ) मोवाइल भर्सन टेम्प्लेट लाइ इनएवल गराएको थिए ! bro but mero blog ta dherai wota column bhako ani tabbed menu bhako chha. mobile version ma yes gareh pani mobile bata khulda ustai aucha.... kina?? ani... the description in meta tag comes at the front of the blog... even more, the title also comes at the front... can't get any solution for that... bro would you suggest me?